Irving's 'holocaust' lite / but what '2.4 million document'? “They’re doing very important work,” he said, adding that revisionists keep mainstream Holocaust scholars on their toes. He dismissed the charge that revisionists are motivated by factors other than the pursuit of historical truth, such as antisemitism. It's also quite apparent that this forum is being read by the likes of 'Forward'. A famed Holocaust denier is revising his revisionist thinking — and the move is opening up a rift among his fellow travelers. David Irving, who was released from prison last December in Austria after being convicted of Holocaust denial, recently announced that he is rethinking his position on the fate of European Jews during World War II. Irving now concedes that a mass slaughter of Jews may have occurred. In a series of interviews, including one with the Forward, Irving outlined his new beliefs. 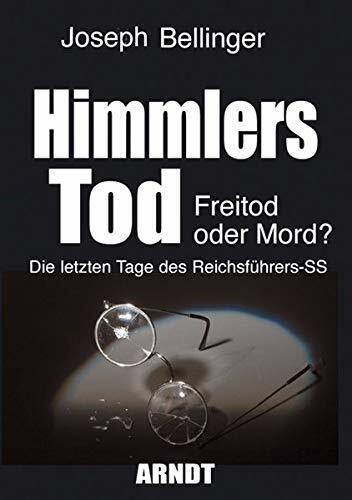 After his release, he said, he discovered in a volume of trivial Nazi communiqués a memo from SS major Hermann Höfle that refers to “S,” “B” and “T” — code, Irving claims, for the concentration camps Sobibor, Belzec and Treblinka. He said he is 80% sure that the document is genuine and that no other piece of Holocaust evidence has seemed as legitimate. Irving’s current conclusions still lie far from those of mainstream Holocaust scholars. He believes that around 2.4 million Jews were killed by the Nazis, that Auschwitz was not a death camp and that SS chief Heinrich Himmler ordered the murders behind Hitler’s back. Deborah Lipstadt, an Emory University professor whom Irving unsuccessfully sued for libel in 1996 after she described him in print as a Holocaust denier, was unimpressed by Irving’s new stance. Lipstadt questioned the wisdom of devoting airtime to Irving, who by many accounts craves the limelight. “He should be met with a big yawn,” she said. Indeed, the conclusion will likely have no effect at all on mainstream Holocaust scholarship, a field in which Irving has long been discredited. It has, however, illuminated a rift between those revisionists who refuse to entertain the possibility that the Holocaust occurred and those who say they are skeptical. Irving confirmed that he has made many new enemies in the revisionist community and kept old ones. Irving, 69, began writing about World War II in his youth, often expressing sympathy for the Third Reich. His books were dismissed by critics and historians but sold well. In 1988, the American execution specialist Fred Leuchter’s claim that there was no evidence of gas chambers at Auschwitz convinced him that the Holocaust had never occurred. Eight years later, Irving sued Lipstadt for libel after she described him as a Holocaust denier in her book “Denying the Holocaust: The Growing Assault on Truth and Memory.” Irving lost the case. In 2005, Irving was arrested in Austria for having publicly denied the Holocaust in that country in 1989. He was convicted and sentenced to three years in prison, but the decision was overturned on appeal late in 2006, after he had served about a year. One of Irving’s main allies in the United States is Mark Weber, director of the revisionist Institute for Historical Review. Weber countered the claim that Irving is simply engaged in a publicity stunt. “Those people who are disappointed that Irving has switched [sides] shouldn’t be, because he’s always been ambivalent,” Weber said, adding that Irving’s current stance marks a return to the way he was thinking when he published “Hitler’s War” in 1976. Irving agrees with this interpretation of his trajectory. “You must not think that I’ve done anything to rehabilitate myself,” he said. Comments Irving made to the Guardian newspaper suggest the extent to which he does not wish to be rehabilitated. Irving called the Jews “architects of their own misfortune,” responsible for most of the 20th century’s wars. Likewise, he continues to defend those revisionists with whom he now disagrees. And he is confident that his turnaround will not win him any fans in the academic world. “I think that’s a dead duck.” he said. The 'Hoefle telegram'. Does anyone see proof that 2.4M Jews were killed? ... I am eighty percent convinced by the Hermann Höfle document (above), by my own cursory forensic examination of ink, paper, and typewriter, there is still a twenty percent chance that it is a forgery: the misspelling of Reinhardt (as Reinhart), the wrong math, the possibility that the authors simply worked backwards from a well-known figure (1,274,166) in the Korherr report of April 1943 (right) in order to authenticate it, the unusual lack of any register-number or date for the originating query ("Betr.:...") , the prominence of the names involved (Eichmann himself), the top state-secret classification GEHEIME REICHSSACHE found only once elsewhere by me so far in the tens of thousands of otherwise overwhelmingly trivial decodes, the five-page document somehow being bound into the archive file out of page-sequence (5, 1, 2, 3, 4): these are just some of the anomalies unique to the Höfle document. Then why is Irving "eighty percent convinced"? It's strange that Höfle would sign as “Hoefle, Sturmbannführer’. problem since we have "Ä" and "Ü" in the telegram. So the proper spelling of the man's name was Höfle? Not like Goebbels, with the same sound spelled "oe"? I don't think that the Hoefle radio intercept is authentic. The numbers are too close in line with the orthodox number of victims of the Reinhart camps. Where are the transmitting/receiving hard copies of the radio transmittal? 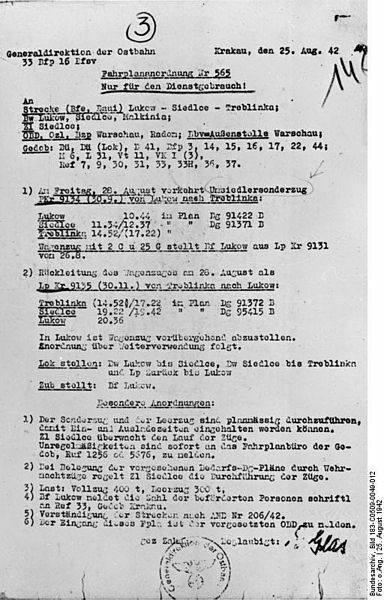 The subject of the message is "14-tägige Meldung Einsatz REINHART" (two-weekly deportation status message of mission REINHART). What happened to the deportation status messages of the other weeks? The Holocaust hoaxsters exaggerate and embellish a 60+ year old event in order to abuse the Palestinians and rob them of their land, while claiming a free pass for their barbaric conduct on account of the "holocaust". Far superior to the self-serving Victor Klemperer diaries are the diaries, recently published, of a Mr Cohn, a humble German-Jewish teacher in Breslau, who applauded Hitler's speeches, understood the anti-Jewish measures -- and was still shipped off east to Minsk and never seen again: I quote from them in my forthcoming Himmler biography. So was that shipped off east to Minsk, as in transported past the Reinhardt "death camps" or "shipped off east" - a diabolical super secret Nazi code for magical mass killings. Hmm.. There he goes again. Irving baits the audience to buy his up and coming Himmler book which will no doubt ripoff large portions of the ground breaking book on Himmler by Joseph Bellinger. And Irving, ever so hungry for cash, will attempt to play 'holocaust' lite with his Himmler scam, regardless of the proof against such a position. 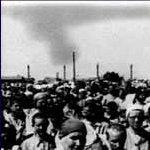 Quite simply, there is no proof that Jews shipped 'east of Minsk' were 'exterminated'. None, nada, zilch. No one can produce it. Irving is now all about making money. He will say anything for that purpose. His duplicity has reached new heights. My opinion - for whatever its worth...I really don't see what the problem is. Irving is an individual. he doesn't claim to represent you or the 'revisionist community' (if such a thing exists). He's entitled to say what he wants. And people are entitled to buy / read what they want and make up their own minds. If he is talking rubbish for profit, he'll be shown up. All this 'boycott' stuff is silly. Personally, my attitude to him is more one of a shrugged shoulder and a wry smile. "So the proper spelling of the man's name was Höfle? Not like Goebbels, with the same sound spelled "oe"? " down to the single digit, confirming Korherrs total. As mentioned before, who copied from whom?" MarkTurley wrote: My opinion - for whatever its worth...I really don't see what the problem is. Irving is an individual. he doesn't claim to represent you or the 'revisionist community' (if such a thing exists). He's entitled to say what he wants. And people are entitled to buy / read what they want and make up their own minds. Historians who refuse to respond to fair questions about their assertions deserve to be boycotted by people who have financially supported them in many ways. No one is asking him to change an opinion, we are asking him to give us the basis for his claims, we're asking for his honest reasoning. Simple as that. Yet he dodges just like 'holocaust' liars. Irving has been quick to encourage financial investments by well meaning people into his 'real history' campaign. ... his dodging of honest and fair questions from investors and readers is not 'real history', it is shysterism. MarkTurley wrote: I really don't see what the problem is. Irving is an individual. he doesn't claim to represent you or the 'revisionist community' (if such a thing exists). He's entitled to say what he wants. That may be true, however the enemies of truth do not see it that way & they will use the tactic of "Guilt by Association" to marginalize you. It's hard enough working or studying in this field without being labeled one of Irving's Simpleton Schleps. Hannover wrote: The 'Hoefle telegram'. Does anyone see proof that 2.4M Jews were killed? Does anyone see, any proof or mentioning of anyone killed on that document ? 1a. What's Irving's current "believable percentage" these days? 1b. If there has been a change, what changed the percentage? They tie in this little gem which somehow means mass murder via transport. I thought I'd bring it back.